Check out Thompsons Treasures eBay store! 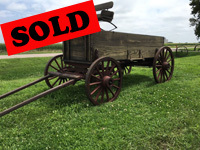 This antique question wagon has wooden wheels that are one and a quarter inches wide the back are 44 inches tall the Front are 40 inches tall the box is 8 foot long 10 inches deep 34 inches wide. It has a nice spring seat, a foot rest, a rein tie, and a metal strip around the top of the box. It has a hitch pin tongue with eveners. This is the original running gear & box has had the wood restored. It has been weather treated. A “must have” for your Christmas decor or sign. Buy it now! 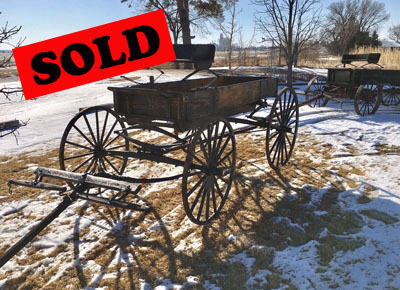 This antique horse drawn wagon is a full-size usable wagon. It’s a rare Woodstock wagon as is marked on the reach plate. It has a new tarp & bows for that and western look. 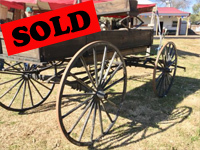 The wagon its self is original with some of the boards replaced to restore it to useable condition. The front wheels are 44 inches tall & 2 1/2 inches wide. The back are 48 tall and 2 1/2 tall. They are good & tight. The box has a step on each side, foot rest & a rein tie. There’s a tension chain in the middle & a nice high back spring seat There’s a metal strap around the top , wheel bumpers & connecting rods front & rear. The box is 10 feet long, 24 inches deep, 38 wide. The tongue is 11 ft long. 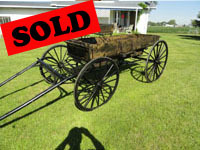 Located in Nebraska which is not too far from anywhere & rich with farm antiques!! Looks great. Buy it now! 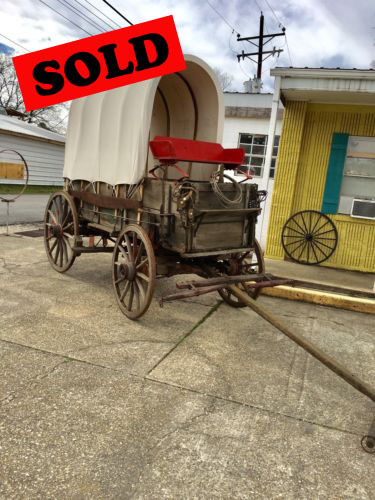 This is an authentic, original, antique, covered wagon, with new tarp & bows. A John Deere, no less The box is Rock island Plow works, which was bought by John Deere. It's all original. 26 inches deep, 2 boards with metal strip at each level, fold out tail gate, tension rods front & back & a chain in the middle. There's a step on each side, foot rest, and a rein tie. It's 38 wide, 10'6 long. The John Deere running gear has original, good brake system with new break shoes. The wheels have been off & greased. They are 1 7/8 inches wide. The back are 44 inches tall & the front are 40. 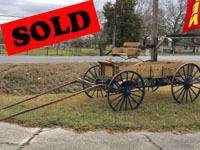 Currently located in Louisiana, this antique wagon is in great condition. Ready to pull. Looks great too! The box is 8' long, 32" wide, and 1' deep. The shaves are 8' long, and the wheels are 1 1/2" wide. The front is 38" tall, and the back is 42" tall. It has been properly restored with all the original hardware. It has also been weather-treated. It has wheel stops, side steps on both sides. Foot rest, rein tie in front. The wheels are 3 inches wide. The back are 44 inches tall and the front are 38 inches tall. The box is 10 ft long and 40 inches wide and 24 inches deep. 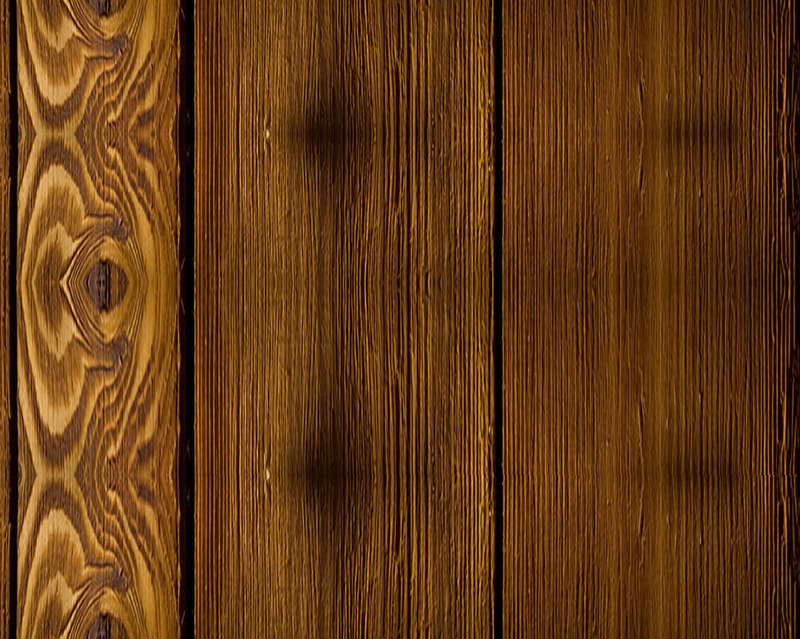 It has been restored with true dimensional lumber and the original hardware. The floor is tongue & groove, there's a metal strip around the top, tension rods front & back both levels, rein tie , foot rest, step on each side. It has a nice high back, spring seat The shalves are 7 ft long and straight. This wagon is ready to go to work for you! Buy it now! The front wheels are 38"; the back is 42" tall and 1" wide. The shafts are 7' long and will fit any normal horse. 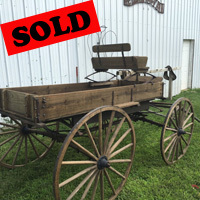 This is an original, antique Peter Schuetler horse-drawn chuck wagon in great condition. The box is 10'6" long, has swing out tailgate, tension rods front & back, chain in the center, original steps on each side, and original foot rest & rein tie. The box is 27" deep and can be lifted apart to make a 1 board high wagon. It has the original wood floor in good condition. The wooden wheels are 2 1/2" wide. The front is 40" tall; the back is 44" tall. Good usable condition with some original paint. This wagon has an original high back spring seat. A chuck box , tarp & bows, a 20 gallon wooden water barrel , a shovel, 3 tine pitch fork, a hay knife and a rope fence stretcher have been included. The tongue is 11 ft long and straight with good single trees & eveners. This wagon is hitch ready. Buy it now! This is a Peter Schulttler original gear. It has an old original box on it, not necessarily a Peter Schuttler, but old and original. It makes an awesome display of Old West tradition. The wheels are 53 by 1 3/4 in the back, and the front are 45 by 1 3/4. The wheels are in good condition, and have been recently greased. This wagon could be pulled. The box is an old box off a farm wagon that someone has redone the floor and painted it red. It is 38 inches wide, 25 1/2 inches deep, and 10 feet 6 inches long. There are connecting rods front and rear, metal strip around the top, a nice spring seat, a rein tie, and good side steps. This wagon has been weather treated. 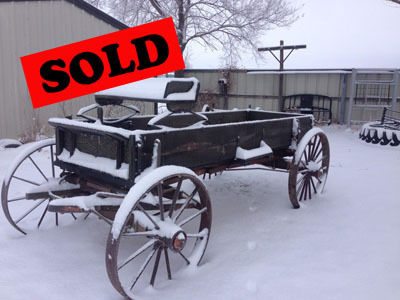 This wagon is great ranch decor / advertising material, with lots of history and character. Buy it Now! Call Dave with questions 308-750-9435. This original John Deere Triumph horse drawn wagon has a chuck box, an extra pan box, and tarp & bows. The box, wheels and gear are all original. It is in good useable condition. This antique horse drawn wagon is an original John Deere Triumph Special. It is in exceptional shape, with some original stenciling. It does have good, functional brakes, with new brake blocks. The wheels are 53 by 1 3/4 in the back, and the front are 45 by 1 3/4. All the spokes, fellos, everything is solid. One of the back wheels has been repaired by a blacksmith, hand forged as would have been done in it's day - they did a nice job many years ago, perhaps when the wagon was fairly new. The wheels are in good condition, and have been recently greased. The box is all original except for the rein tie, and front step, on which the wood has been replaced. One underneath support also was replaced-all as origin. It is 38 inches wide, 25 1/2 inches deep, and 10 feet 6 inches long. There are connecting rods front and rear, metal strip around the top, a nice spring seat, a swing out tail gate, and good side steps. It has a swing out tail gate (bottom level). 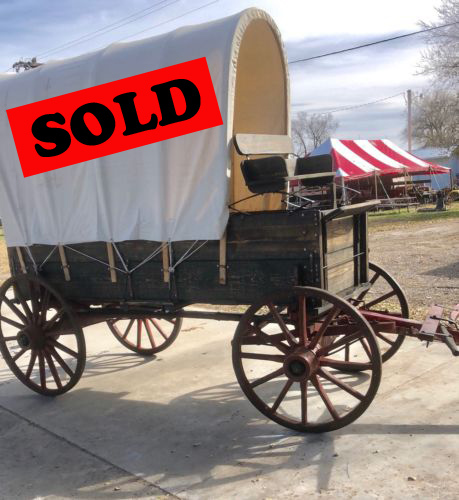 This wagon has been weather treated.This is a good usable wagon, and can be pulled in the parade, in competitions, or around the county. Buy it Now! This is a very nice wagon, at a good price. 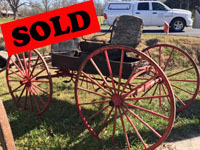 This antique horse drawn wagon a light, high narrow wooden wheeled, spring buckboard, in very good condition, with very good wheels. The wheels have orignal rubber on them to make the right nicer. The springs under the box, and the double coil seat springs also increase the comfort of the ride. The box is 32 inches wide, 10 inches deep and 8 feet long, with a tongue n groove floor. Some of the wood has been replaced in the box, but the hardware is all original. There are connecting rods front and rear. There is a nice spring seat, with double coilseat support / hangers, foot rest with an extra metal piece for scraping boots, tieing reins, or whatever, and a wooden step on each side. The wheels are 1 1/2 inches wide, the back wheels are 44 1/2 inches tall and the front are 39 inches tall. The wheels have been taken off and the hubs greased. They are in good shape with rubber around the edge. The shalves are 6 1/2 feet ong from the eveners to the point. They are 24 inches apart at the tips. It has been weather treated so it can set outside. FREE 90-day storage, if needed. Call Dave for more information 308-750-9435. Questions are welcome. Either email or call Dave, 308-750-9435, please try again if you should happen to miss him. He can also help you line up reasonable trucking options. This Davenport wagon, was made in Davenport, Iowa, in 1904-1910, when John Deere bought out the company. 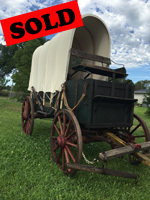 This wagon has tarp and bows added. It is in good useable condition. It has steel wheels and roller bearings. Davenport Wagon Co., established in 1904, held a unique niche in the market: production of steel wagons. Launched by partners Nathaniel French, G. Watson French and J.L. Hecht, the company boasted a "one-horse-lighter" draft, claiming its wagons' wheels turned more easily on roller bearings than on the cast iron or steel skeins used in wood wagons. Deere & Co. quickly established itself as a market leader in wagon manufacture, acquiring highly regarded, established suppliers. Acquisition of Fort Smith (Ark.) Wagon Co., Davenport (Iowa) Wagon Co. and the Moline (Ill.) Wagon Co. in 1910-11 created a new platform: the John Deere Wagon Works. During the first World War, John Deere Wagon Works prospered, filling military wagon orders. 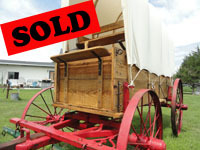 Between World War I and World War II, wagon sales fluctuated with the farm economy. By the mid-1940s, though, farmers were looking for steel wagons with rubber tires. Wood wagon production at John Deere ended in 1947. The box and seat have been restored with Alaskan fir, 1x 12's, true dimensional. The bolts are carriage bolts and square nuts, non coated, so they will rust to match. The hardware is all original. It has a good step on each side, rein tie, foot rest, and lift up end gate, metal strip around the lower level, tension rods front and back. The floor is good, tongue n groove. The bottom board is 12 inches wide, the top is 12. It has been treated with linseed oil. The tongue is 10 feet long with like-new eveners. The double tree is made solid, and is steel, which makes a nice solid step. It also has a 12 foot long steel tongue that is not in the pictures that was made for this gear originally. It has a removable wood tongue in it for easy access, so it could drop down in the front. The steel tongue is a stiff tongue and will be included. The wheels are 3 inches wide. The backs are 48 inches tall, and the front are 40. The box is 10 ft long, 24 in deep, 38 in wide. A nice high back spring seat is included. This wagon can be pulled, used, or used for ambiance. Looks great in the yard.